The past couple of weeks have been fun at work. My manager is away for a vacation and has informally allowed me to run some of her work. I loved managing and strategizing new campaign ideas, thinking through people’s thoughts, and reconvening every now and then to check back on the progress. It was interesting to see how much time and effort it takes to manage people than being a lot myopic and just doing a portion of the work. Since work and working out take up most of my time on the weekday, the weekends have been spent making new, and at times, new versions of old recipes. Last weekend was spent making and reshooting fudge brownies. As I was making them, I was thinking of textures. How ingredients adds levels of not only flavor but also… mouthfeel. Ingredients that make your mouth, tongue, and teeth move in different, non-synchronous ways. They force you interact with the varied elements of the dish providing not only taste but a level of satiety that you may not get from something like a well made mashed potato. Textures in the brownie came from a variety of different ingredients and techniques. I made this batch with just brown sugar that gave it a thick gooey center. The rigorous whipping of the wet ingredients helps to create air and a thick crackling crust on top. A chocolate chunk reiterates the flavor of the cake while helping with a non-synchronous mouth movement, and finally an espresso coffee powder that adds depth of flavor. Textures are an amazing thing to achieve in a baked good. 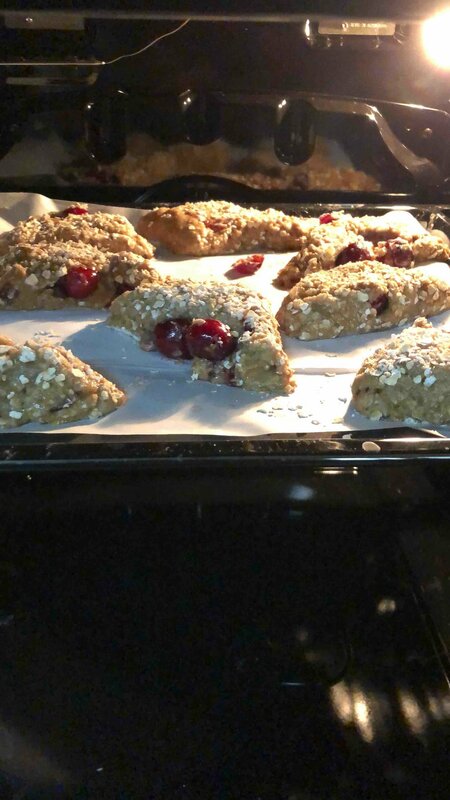 These cherry cream scones were built with a similar intention. Part of my summer fruit series, I decided to bake cherries. While I usually do galettes, the cherries at the time were too sour and you cant put a wet compote in a galette. Therefore, I decided on making scones! Scones are a little weird to describe if you have never had them before. They are like a sweeter version of an American biscuit, but harder like an English muffin sans the semolina. Textures in this scone were plenty. I used granulated brown sugar sprinkled with a fresh lemon zest that I press down into the sugar until the oils perfume and dampen the sugar replicating a texture of wet sand. You have no idea how amazingly well sugar can infuse flavor until you have tried this method! I used steel cut oats to give it a bite, a strong binding agent, and most importantly— make you feel like you’re having something healthy. I used the cherries in two ways— compote and whole fruit. The compote added flavor throughout the scone while the fresh cherries once baked had a texture similar to raisins while retaining the juiciness of a cherry. Cream played an important role in the texture profile by subduing the flavors. It was like a bridge that smoothened the overall experience by connecting the different ingredients into a homogenous journey. These scones were a lot more fun to make than I thought. I don't like baking, but I think I’m getting better. As I write this, I am in the process of remaking our homemade pizza recipe. The next couple of weeks should be fun with a lot of new recipes in the pipeline. I hope you make these scones and let me know what you think! Place a rack in upper third of oven; preheat to 200° Celcius. Finely grate zest of 1 lemon with a microplane into a large bowl. Add ⅓ cup sugar and massage with your fingertips until the mixture looks like wet sand and is very fragrant. Set aside remaining lemon for another use. In a sauce pan, bring all the ingredients of the compote to a simmer and let the fruit break down completely. About 15 minutes until the mixture begins to bubble like a candy. Add 150 grams of fresh cherries, the compotes, and fold mixture with a rubber spatula, taking care only to mix until cherries are distributed throughout and you have a sticky dough. It’s okay if some of the cherries bleed or get broken up. Dust countertop liberally with more flour and turn out the dough. Pat down into a 1"-thick square, flouring hands lightly to prevent sticking as you work. Mix 1 egg yolk and remaining 1 Tbsp. cream with a pastry brush in a small bowl. Brush yolk mixture all across the surface of the dough.